The Dyson DC44 Animal is the company's latest answer to space-saving vacuum technology, but does the handheld cleaner bring enough to the table? The Dyson DC44 joins the brand's relatively new range of vacuum beasts, including the Dyson DC39 Animal (£339.99) and smaller Dyson DC38 (£299.99), as well as the upright Dyson DC40 (£349.99) and DC41 (389.99). As a handheld, this one, of course, is far smaller than the others and has been designed specifically for urban living. We were lucky enough to get our hands on one, and put it through its paces by letting it give T3 Towers a once-over. As with everything that comes out of Dyson HQ, the design is sleek, chic and instantly recognisable. This is a gadget that we would have no problems storing in plain sight - a very practical possibility thanks to the wall-mount that comes in the box. The DC44 is 2.3kg of lightweight aluminium and plastic - designed primarily with comfort and ease of use in mind. It might start to feel a little heavy in the hand after a while, but it's still more than manageable in one hand and has excellent balance to it. It's easy to whizz it around the floor, before removing the carpet attachment and hoovering worktops, ceiling corners and skirting boards. The battery that powers this monster is a 22.2V nickel manganese cobalt battery, and it squeezes out a solid 20 minutes before performance drops rapidly. Importantly though, the battery is designed to be fade-free, meaning that you get 20 minutes of consistent high performance. The Dyson DC44 also uses the company's Root Cyclone Technology - a fancy bagless cleaning system that is powerful enough to lift dirt out of your carpet. The dirt then goes straight into an - admittedly quite small - chamber, which is released and emptied by two simple button pushes. Unlike upright and cylinder vacuums, the DC44 is a joy to use, rather than being an exercise in furniture and cable aversion. Being cordless and light means you don't have to worry about dragging your vacuum out of a cupboard, then around your flat. And as previously mentioned, it's super simple to empty out. The DC44 is incredibly powerful for a battery-powered, cordless vacuum and had no problems with any of the surfaces we threw it at. Occasionally it might struggle on it's standard setting with a deep pile carpet, or entrenched dirt, but the max button that sits near the trigger gives you extra power when you need it - more than enough to see away these kinds of obstacles. 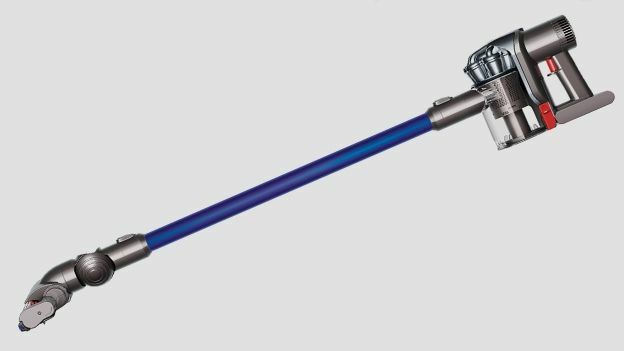 The Dyson DC44 is capable as both as a 'dustbuster' type gadget, as well as a genuine option for cleaning your flat. It's easy to use, easy to store, easy to empty and keep clean... we could go on. The design constraints mean that the DC44 is only really suitable for small living spaces. The battery gives you 20 minutes of high-performance suction before it starts to die off noticeably (or 8 minutes on the max setting), which really is not very much. If you don't think you can vacuum your whole place in 20 minutes, you might want to consider something else. If the price and time constraints don't bother you, then this is a fantastic option to have. Moreover, it's another phenomenal piece of Dyson engineering.